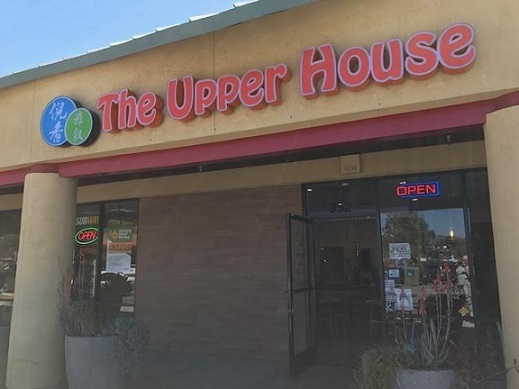 The Upper House, 352 S. Indian Hill Blvd. (at Arrow), Claremont; open daily until 11 p.m. 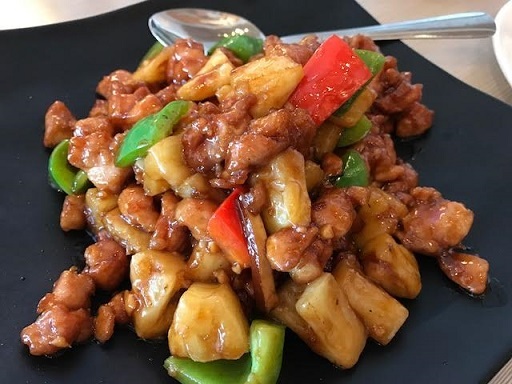 Located in Peppertree Square, the center most of us visit only for the Peruvian restaurant Kykiryki, the Upper House opened in January, replacing Royal Panda, which by all accounts (I never ate there) was your typical quick-serve Chinese restaurant. The Upper House, by contrast, is a sit-down spot, and it serves real Chinese food. I met some friends there for lunch on a recent Saturday. Inside it’s all blond wood, light and airy, and the service was exceptionally friendly. The menu is long, typical for a Chinese restaurant, but not absurdly so. In an unusual touch, the lunch menu ($8 to $10) is good seven days a week. But we ordered off the regular menu: cumin lamb ($14), pineapple chicken ($10, below), combination noodle soup ($10) and vegetable lo mein ($8). 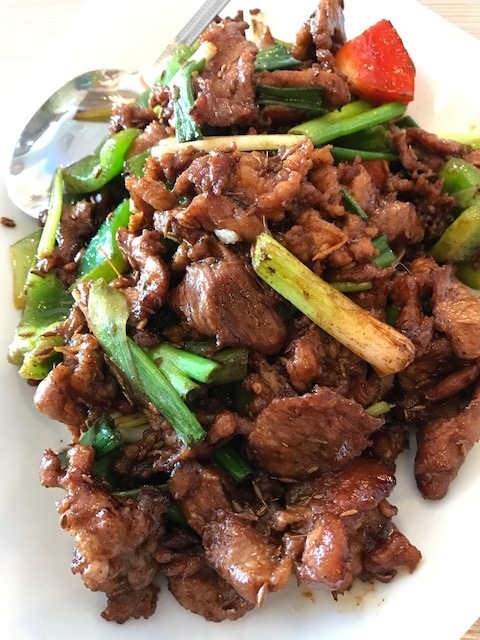 I got the cumin lamb, a dish I’ve had at a couple of other restaurants, one in Chino Hills, the other in Alhambra, and this version was their equal. 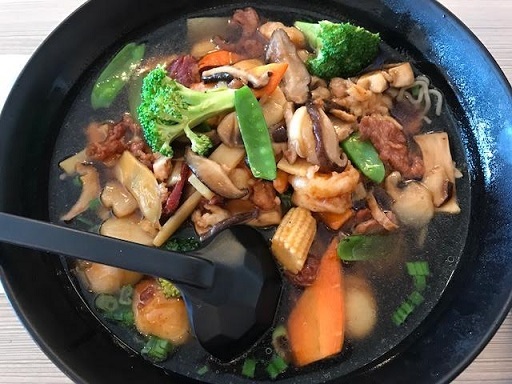 By my standards, then, the Upper House is among the handful of authentic Chinese restaurants in the Claremont-Pomona-La Verne area. As for the name the Upper House, we asked and were told it doesn’t really mean anything. But it’s more interesting than the generic Royal Panda. 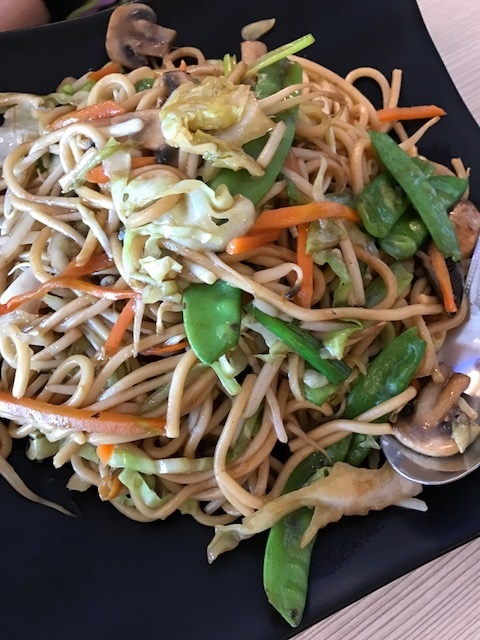 Good Chinese food and a friend who says “ibid.” You live a full life, David. (But “W” Indian Hill?). Nice to see good stuff in my old Claremont ‘hood. Also had to laugh thinking how many food journalists have been told, “write that down” by dining companions. Oops, changed the W to S. I’ve had plenty of sources tell me “write that down,” including once during a council meeting. But you let me down, I regret to say; I was sure Bob House would try to claim he was related to Upper House. I had lunch here yesterday with my niece, and we both enjoyed it. I had it on good authority that the cumin lamb was pretty good, so I had that and found it delicious! My niece’s mushroom chicken was just so-so. But we shared a bowl – a really large bowl – of the milk snow ice (I think) with mango, strawberries and kiwi. Oh man was that good – I’d go back just for that!! Ended our visit with boba tea, which initially tasted bland after the super sweetness of the milk snow. After my taste buds adjusted, the tea was good. Glad to hear you and your niece liked the place, Deb. I’ve been back once since and had another good meal. 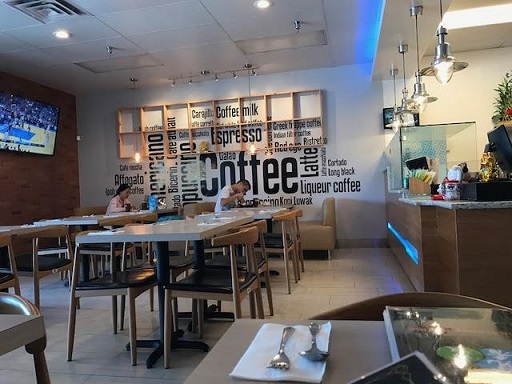 I did think upon a second look at the menu that it wasn’t quite as authentic as I’d first thought, but the food’s good and I’m looking forward to my next meal there.